Philippe Mazé (b.1954) began his musical education studying with Daniel Roth and Gabriel Looren, and later moved to the Ecole Normale de Musique in Paris where he studied harmony, counterpoint, fugue, history of music, analysis and aesthetics, winning prizes and diplomas in each of these subjects. He studied choral conducting with Stéphane Caillat, Eric Ericson and Andrea Georgi, and orchestral conducting with Henri-Claude Fantapié. After obtaining diplomas in these two disciplines, he then studied singing with Annie-Béatrice Lepré and the teaching of vocal technique with Richard Miller, winning yet another prize and diploma. Philippe Mazé became Chapelmaster at the Basilique du Sacré-Cœur, Montmartre and Director of Music at the choir school at the age of 23, a post that he held for 18 years. In 1996, he was honoured with the title ‘Maître de Chapelle émérite de la Basilique du Vœu National’. At the same time, he became Chapelmaster at the Eglise de la Madeleine, Paris. 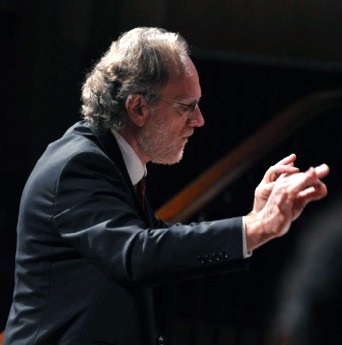 Well-known as a choral conductor, he is often asked to conduct a vast repertoire of music, both sacred and secular, and in 2004 he was commissioned by the Choir of Monaco Cathedral to write the Te Deum pour S.A.S. le Prince Rainier III de Monaco for choir and orchestra, which was premiered in November 2004 at Monaco Cathedral in the presence of members of Prince Rainier’s family. As well as a career teaching choral conducting, he is a busy composer. His works – more than 100 motets, 20 masses, several liturgical works, works for organ, guitar, 3 orchestral pieces – are published in England, Germany, Switzerland and France. They are performed regularly as part of Catholic, Anglican and Protestant church services, as well as in concerts. Their style, simple, direct and profound ‘by a craftsman of sonority’, is recognisable by the desire for expressiveness without losing the sense of the words or the deeper meaning within the chosen texts, austere or lyrical, passionate or ecstatic, and without giving way to fashions. SATB choir a cappella, SATB soli ad lib. 1.What the Thrush said; 2.Bright Star; 3.Why did I laugh tonight?